This mystery started simply enough a few weeks ago, just as the snow had mostly melted from the last blast of winter weather here in New England. 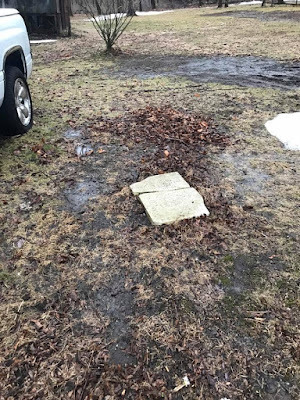 I dropped by a friends home in the Town of Litchfield (Litchfield County), Connecticut and immediately noticed what appeared to be an old headstone laying flat in the back yard just beyond the driveway. The first thing I had to do, of course, was tender my excitement as a long-time genealogist because we often see 'headstones' and other family history artifacts where there are none. We're just always hoping for that next fun mystery to unravel, even if it has no connection to our own family. In this case, it really was a headstone — or I should say it was the two pieces of an old headstone which remained. The house, having been built about 1850, was near the center of town and so I initially wondered if it was possible there was a burial on the property. What follows is the story as it unfolded and the sources I referenced to unravel the mystery of this old stone. The image at left shows the headstone exactly as I saw it, laying face up in two pieces. A careful inspection yielded a partial transcription of the names, dates and epitaph. 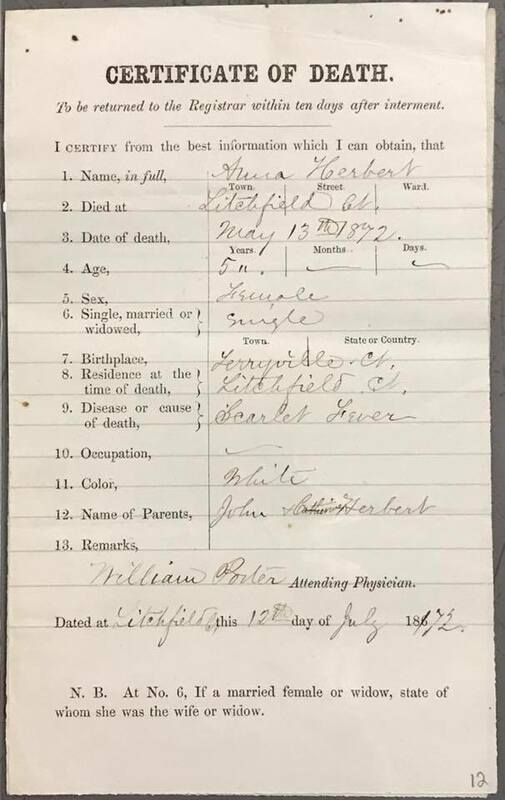 "Æ 3" and "Æ 6" "_____________, 1872" and "May 13, 1872". "Children of John & Catharine Herbert"
which ___ heaven to bloom. May they ______ _____ _____"
After dutifully photographing the stone, I wrote as much of the transcription on an index card as I could reasonably determine, knowing I'd make time to check other sources later. Next step was to ask my friend, the owner of the home, what she knew about the stone. That's when the mystery grew a bit more interesting. She shared that a few years earlier, a neighbor living on an adjoining property approached her and asked if she wanted an old headstone. The reason she was being offered the stone, according to the neighbor, was because it had been stored in the basement of her home until 2000 and, just before she acquired the home, the previous owners offered the stone to the neighbor who accepted and had held it for about 15 years. I've not yet been able to determine just how long it has been in or around the home where it now rests, but these things take time and a little bit of luck. This isn't the first time I had come across a headstone or grave marker in a place other than a cemetery where it belonged. Sadly, it is not uncommon in Connecticut and elsewhere in New England to find old stone markers in people's gardens or antique shops. In one case, I even learned of an old memorial stone being stored in a maintenance closet of an old school in the City of Bridgeport. My next step was to use the information I obtained from my partial transcription and compare that with one of various sources I had access to online. 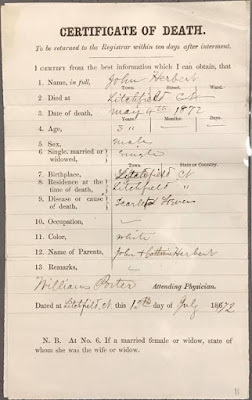 With the possibility of two deaths in 1872, I knew one of the first places I wanted to search was the 1870 United States Federal Census, which would hopefully contain information for a family matching the names and approximate dates in the Town of Litchfield. That turned out to be exactly the case and confirmed my initial guess. 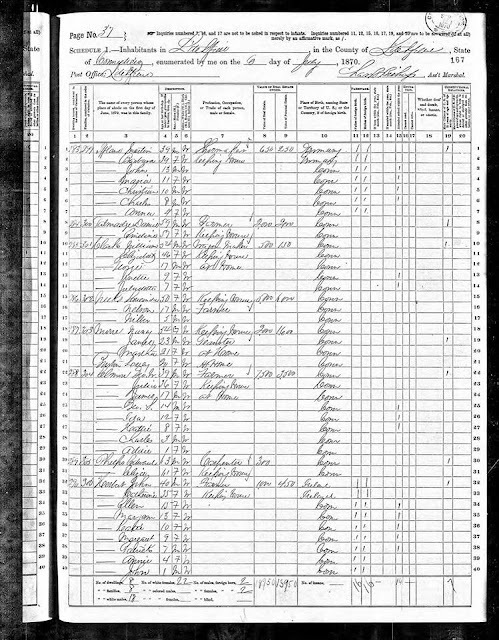 I've had a long time fascination with census records and the great family-centric clues contained within. While it's difficult to say with certainty just which of the genealogical sources is my favorite, certainly the population and other special schedules of the United States federal census are full of wonderful clues and high on my list of favorites. 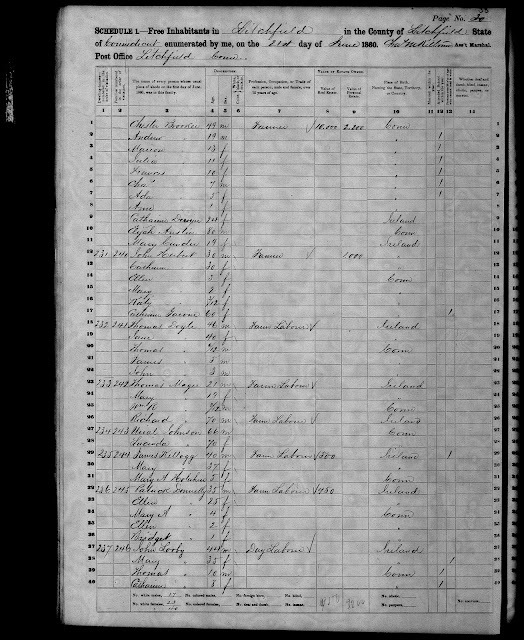 The entire Herbert family can be seen on lines 32-40 at the bottom of this page from the 1870 U.S. Federal Census. This was the ninth census of the U.S. population and the first to list the names of each person in the household. 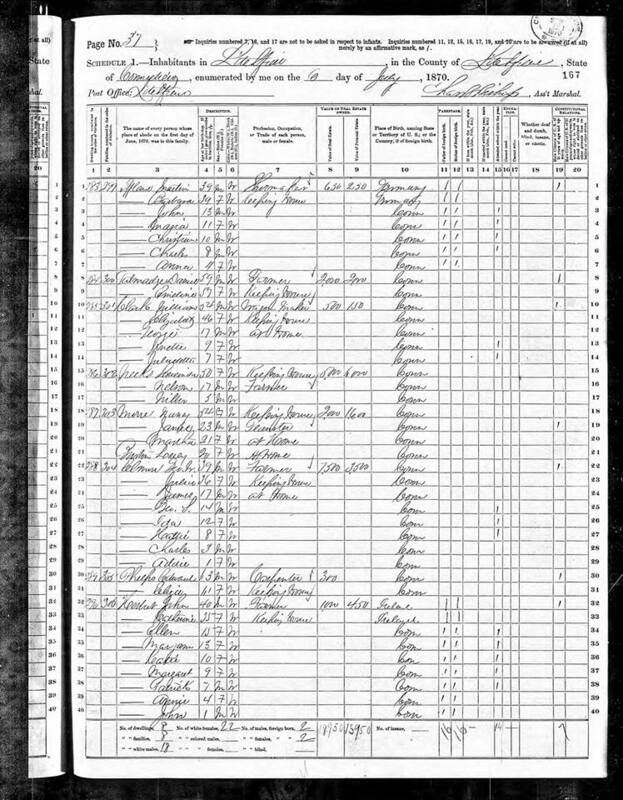 Even though the census enumerator recorded the details for the Herbert family and their neighbors on the 6th day of July 1870, it is supposed to represent the makeup of the household as of the 1st day of June, 1970. The nine members of the Herbert family as recorded in the census included John Herbert (40 year old farmer, born in Ireland about 1830) and his wife Catherine (35, born in Ireland about 1835). Although not specifically listed as sons or daughters, the seven children living in the home and ranging in age from 15 to 1 are presumed to be children of John and Catherine. From eldest to youngest, the children — all born in "Conn" — were: Ellen (age 15, born about 1855), Maryann (13, born about 1857), Katie (10, born about 1860), Margaret (9, born about 1861), Patrick (7, born about 1863), Annie (4, born about 1866) and John (1, born about 1869). This singular source validates the information transcribed from the broken stone, only partially legible. The census shows John & Catherine Herbert with 7 children. If two of those children had died in 1872, aged 3 and 6, then I would expect to find at least two children, one born about 1866 and another born about 1869. It would appear that the two youngest children, Annie and John, may be those memorialized by the old stone, but I've still got some work to do in order to be certain. The entries highlighted in red text above appear to support my earlier research and assumptions. 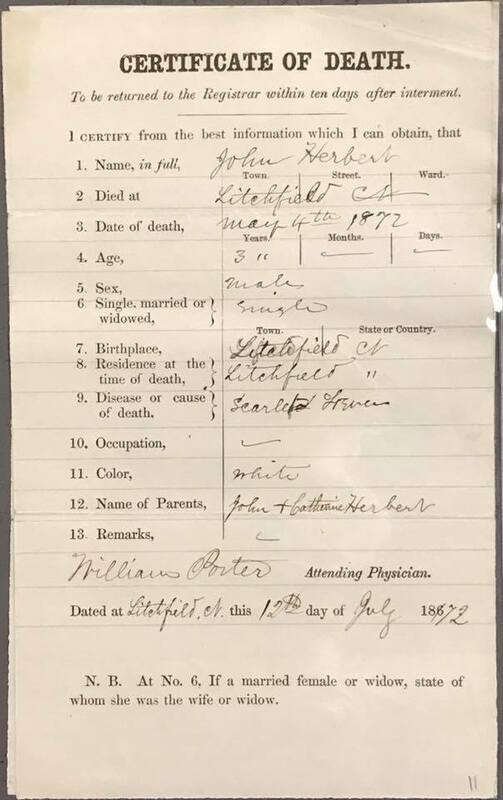 A further check of the original Hale Collection documents, available in digital form on Ancestry.com, show John Herbert and his sister Anna both died in May of 1872. Further clues show the children's father, John Herbert, died in August 1890. His wife Catherine is shown to have died in April 1899. There were a number of sources I could consult next, but decided my next stop would be the local town clerk to research the death records for the children in question. 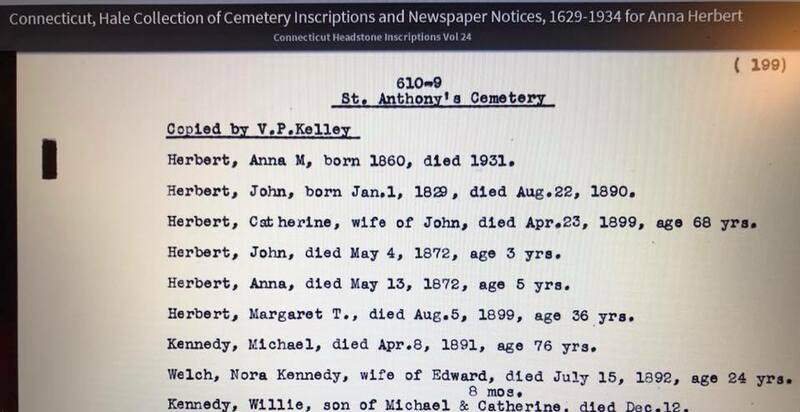 While it is not typical to have individual certificates for deaths occurring in the 1870s (in Connecticut, it is more common to have line item ledger entries during this period), I was lucky. Without too much effort, I found death records for each of the two Herbert children who died in May 1872. The cause of death for both is listed as Scarlet Fever. Next would be a trip to St. Anthony Cemetery. I called the cemetery and learned that no record of earlier burials exists, so I had to rely on some good old fashioned foot work. To my surprise, it didn't take long to locate two large HERBERT monuments with surrounding foot stones. They mystery of the stone was not much of a mystery any longer, even though questions remain. 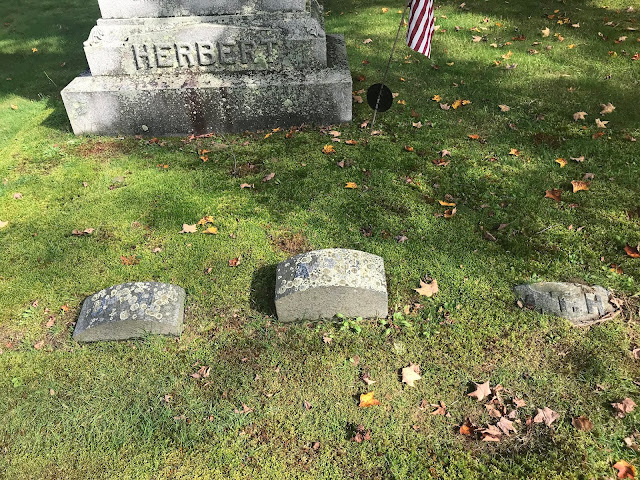 Given that my friends home is located on East Street, just a short walk from Litchfield's East Cemetery, it is my belief that the two Herbert children were first interred in the nearby East Cemetery in 1872. I have yet to determine if the Herbert family ever owned or lived in the home where the stone now rests, but that's on my list to research one day. When the father died in 1890, it is plausible to envision that the family purchased a larger plot in St. Anthony Cemetery and erected a larger family monument, including new matching foot stones for children John, Anna and Margaret T. who died just a few months after her mother in 1899, after having lost both parents and two siblings. 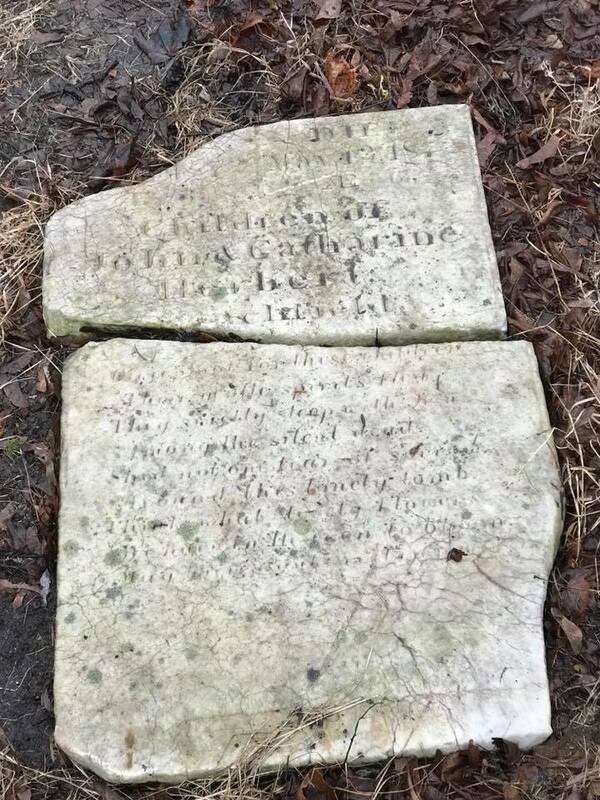 The original white marker would no longer be needed, so could have been retained by family or perhaps a cemetery worker or stone carver. 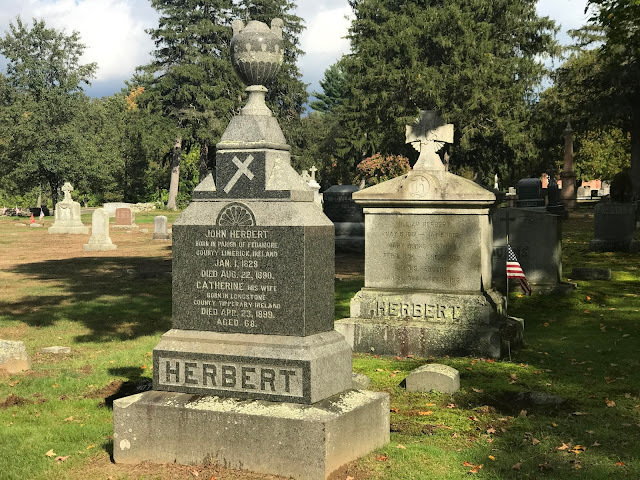 The photographs below have been updated to this post in October 2018, showing two larger HERBERT monuments. Note the importance of evaluating all sources of data, the stone rewarding us with additional clues about the family origins in Ireland. John "born in Parish of Fedamore, County Limerick, Ireland" on the 1st of January 1829. Catherine was "born in Longstone, County Tipperary, Ireland." 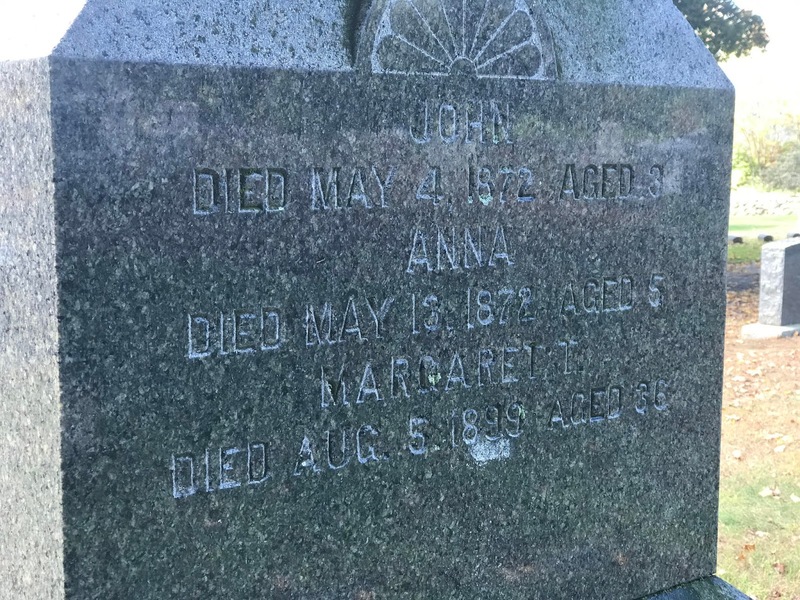 While the headstone states her age at death as 68, giving an approximate year of birth as 1831, that is not consistent with the approximate year of birth calculated from her age at the time of the 1870 census. Among the other clues we find in the 1870 census is the fact that the oldest child listed, Ellen, is 15 years old and reported as born in Connecticut. This would place John and Catherine in Connecticut about 1855, quite possibly earlier. The 1880 U.S. Census does have an entry for the Herbert family, living in Litchfield, Enumeration District 21, and the family is John (51), Catherine (47), daughters Mary (22), Katie (21), Maggie (19) and son Patsy (16). 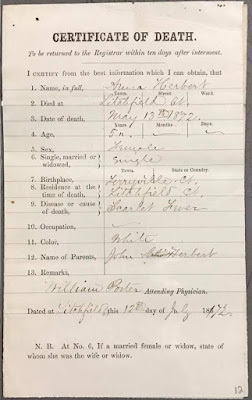 It is not yet known if the eldest daughter Ellen had died between the time the 1870 and 1880 census were conducted or is she was married and appears on a separate population schedule with her family. Given that she does not appear to be interred in the family plot, it is believed that Ellen married and had a family of her own. An initial evaluation of the Catholic Parish Registers, Fedamore, Diocese of Limerick, County of Limerick, Marriages 20 June 1833 to 17 July 1884, has not yet yielded a marriage for this couple, so it is not known if they married in Ireland or in the United States. A search on Google Maps shows that by current drive-time estimates, it is just 49 minutes drive or 53km (about 33 miles) between Fedamore and Longstone. Further research may someday provide details as to where and when John and Catherine met and were married, but their existence in Litchfield is well documented. 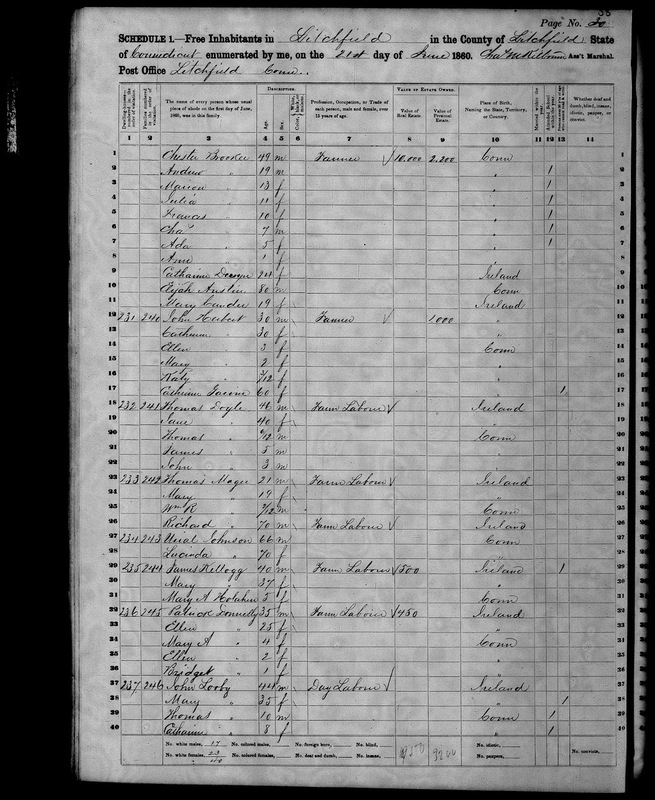 The 1860 U.S. Federal Census (lines 12-17 in the page shown) has an entry for John Herbert (30, born about 1830), Catherine (30, born about 1830), Ellen (3), Mary (2), Katy (3 months) and a 60-year-old female named Catherine Garvin. It is likely that she is Catherine mother and the children's maternal grandmother. 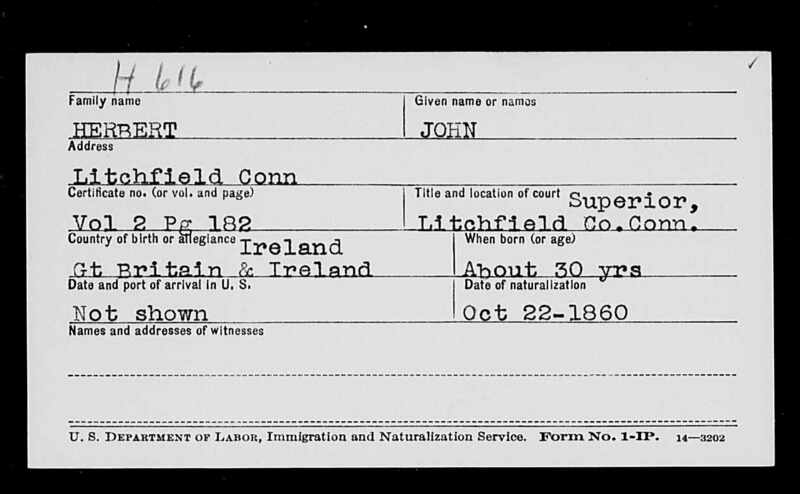 It appears that John Herbert was naturalized on 22 October 1860 at Litchfield Superior Court. 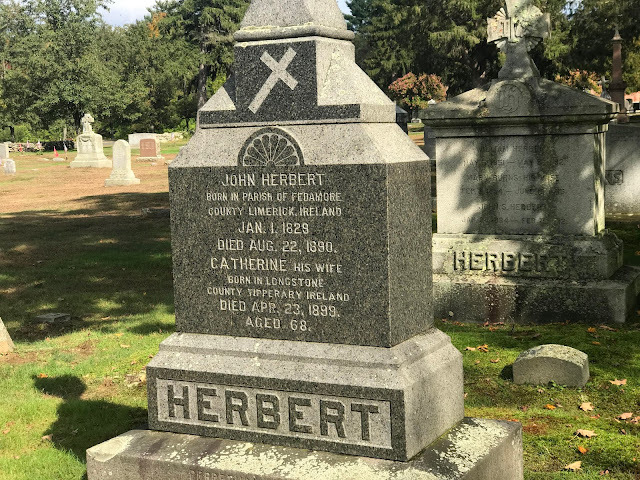 It is not yet known if the John Herbert (age 20) living and working as a farmer in Stamford (Fairfield County) Connecticut was the same Irish immigrant. In the video below, the author of this article, genealogist Dan Lynch, appeared as a guest on a morning news show The Morning Report (4 April 2017) with host Atty. Rachel Baird. Discussion of this headstone begins about 5 minutes into the programming.